Continuing on in our Pulitzer-qualifying “What It Is & What It Isn’t” series, covering some of our newer, lesser known products, we continue on with the Marco Uber Grinder. What is the Uber Grinder?With the delicious madness that is manual brewing sweeping the land of specialty coffee, there hasn’t been quite a performance driven grinder to match the level of thought and input that manual brewing requires. This is quite worrisome, as you spend 3-5 minutes (or more!) on a preparing a single cup of brewed coffee to only result in maddening quality variance, over/underextraction, and, above all, a sub par cup of coffee. Properly BREWED coffee is a function of an appropriate amount of coffee surface area exposed to hot water and time. Done correctly and you get 18-22% extraction (percent of coffee mass removed from coffee grounds) with 1.15-1.55% brew strength (concentration of coffee solubles in brewed coffee), depending on your preference. Grinding is a critical link in this equation in that it determines the total surface area of the coffee being exposed to the hot water. The finer the grind, the more the surface area, and the more the extraction. The coarser the grind, the less the surface area, and the less the extraction. From here on, it gets a bit more complicated. Different burr designs – blade, flat, conical, roller – result in different shape of the grind. Unless you have an electron microscope, the shape is probably not as big of a concern for most practical applications. 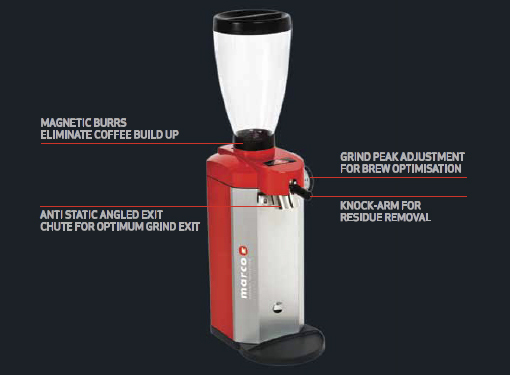 What is of greater concern is the uniformity of the grinds – that is, the consistency of the grind sizes. This is translated into particle size distribution, expressed in sieve sizes, microns, or, most pragmatically, particle size distribution graph. Uber Grinder’s particle size distribution chart (in RED). There are two predominant methods in coffee to analyze particle size distribution. One is with lasers and obviously more restricted to a dedicated lab setting. You get a nice graph seen above. The other is with sieves. There’s Ro-Tap but, due to its exorbitantly high cost, very few are frequently used in the coffee industry. Then there’s the mini grind sizer from coffeechemistry.com, a hand-shaken portable sieve set great for everyday use. Not only can it help you to brew a better cup of coffee, you can also shake and dance around in the process of doing so. The key to proper extraction in BREWED coffee is grind uniformity. For manual brew, the optimal grind size is around 800 microns. If you have a less uniform batch of grinds, the smaller grind size portion of it will be overextracted (resulting in bitterness) while the larger grind size portion will be underextracted (resulting in peanutty, grassy tastes). All else being equal, a more uniform grind will produce a cup with more clarity and more representative of the coffee being used. The ideal shape of a particle size distribution graph for brewed coffee would be one that’s very tall and narrow. Compared to common drip coffee grinders, the result is something you can literally taste. The difference in particle size distribution can be clearly seen in the contrasting lines in the above graph. First of all, stop using Robur or Kony E’s for drip brewing! They are designed for espresso! Second, Uber Grinder is excellent for drip coffee grinding, particularly for single cup brewing applications. If you focus so much on sourcing the best and the latest coffees to feature at your bar, why let something as simple as grinding mess it up? The Uber Grinder may command a price premium over typical retail coffee grinders but considering the consistency and additional quality in the cup you can achieve, it may be well worth your consideration.